If the weeks and months of the year to date have taken their toll on your soul and your skin, there’s nothing to do but recuperate and replenish. Trust us, self-care is an essential practice, which means a visit to a day spa is almost akin to visiting the doctor. While there are plenty of top-notch pampering spots in close proximity to our homes, we’re in love with the idea of abandoning the city in favour of a day spa that’s beyond the reaches of the city. Clear your schedule – this weekend is all about massages, facials, treatments, soaks, exfoliations and, most importantly, you. To the south of the border between Queensland and New South Wales sits Halcyon House, a pristine beacon of coastal relaxation housed within a surf motel turned beachside retreat. This wholesome sanctuary is the perfect spot to shed the week’s woes and indulge in some much-needed TLC. Halcyon House’s day spa offers soothing treatment rituals including Sodashi facial therapy, pro-dermal corrective treatments, healing, tension-releasing and relaxing massages, all-over body treatments, scalp and hair masks, foot and hand treatments, manicures, pedicures and packages offering a bit of everything. You’ll be feeling like a brand-new person afterwards. Check out the spa menu here. 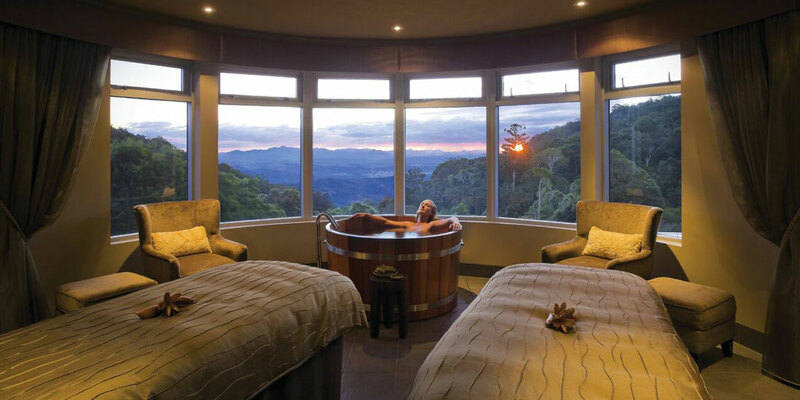 If you’re seeking a tranquil oasis in the heart of the Gold Coast hinterland to help reset your inner being, Gwinganna’s spa facilities are a sure thing. Boasting an indoor-meets-outdoor 33-room spa (one of the largest in the southern hemisphere) Gwinganna features everything from elevated outdoor decks overlooking 200 hectares of native bushland, peaceful gardens, steam rooms, custom treatment rooms and more. The spa menu includes music and massage fusions, Japanese-style acupuncture and hot-stone combinations, multi-faceted massage experiences, eight kinds of facial, specialised Ayurveda aromatherapy treatments, Eastern therapies and much, much more. Have a look at the full list here. If being one of the most awarded day spas on the Sunshine Coast isn’t enough to get your attention, then perhaps the list of treatments at ikatan Day Spa will sway you. Situated in a lush tropical setting with Balinese gardens and outdoor pavilions to wander through, patrons of ikatan immediately feel at ease upon arrival. This contentment pales in comparison to how you’ll feel upon your departure, especially after enjoying an all-inclusive day package that includes yoga and meditation classes, body treatments, massage, facials, feet and hand treatments, as well as breakfast, lunch, afternoon tea, herbal tea and even a cheeky wine. You can see all the details here. 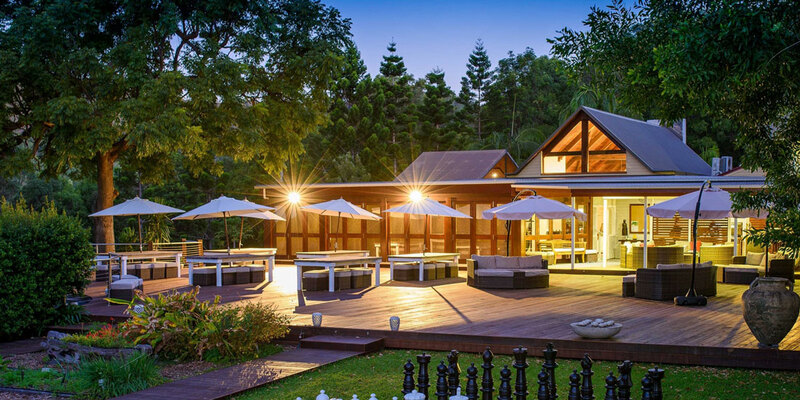 Spicers Peak Lodge is an isolated mountaintop getaway spot located on 8000 acres of World Heritage-listed national park, combining luxury accommodation, dining and relaxation amenities into one gorgeous getaway experience. 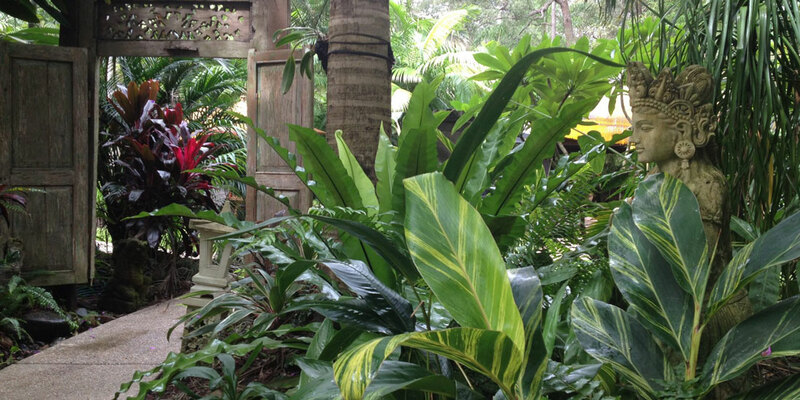 Spa Anise is the on-site pampering palace that offers signature packages and treatments for couples and individuals. Purifying and remineralising body wraps, aromatherapy treatments for head, hands and feet, anti-ageing elixirs, seasonal spa facials, lymphatic drainage massages, hot-stone massages and create-your-own treatments are available. 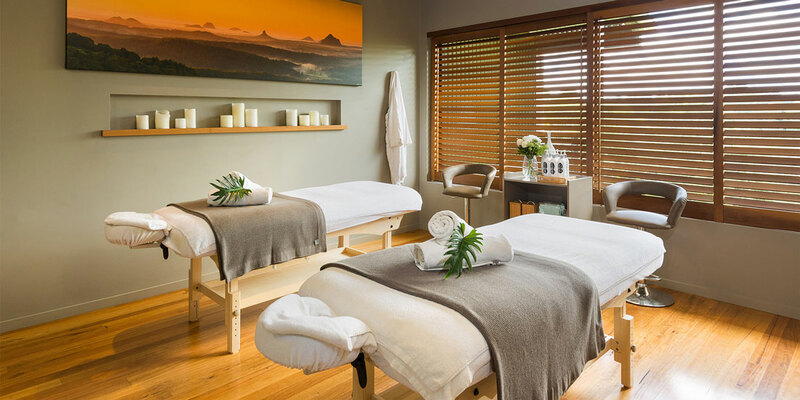 Alternatively, if you’d prefer to get away to the Sunshine Coast, Spicers Tamarind Retreat also boasts a killer day spa that offers the same level of luxury that you deserve. Get a look at the full assortment of options here. Getting off the grid has never felt so freeing as when spent away at O’Reilley’s Rainforest Retreat at Lamington National Park. Stress melts out of your body as soon as you set foot inside this hidden hideaway, starting with the scenic splendour and fresh mountain air enjoyed at the spa’s relaxation lounge and finishing with a detoxifying stint in the on-site steam room. The treatment rooms offer body-melting massages, hot stone therapy, skin-care treatments and Vintotherapy, which uses grapes from Canungra Valley vineyards for an anti-ageing treatment. While waiting for your treatment to begin, enjoy some down time at the spa’s infinity pool. Trust us, the view is astounding. O’Reilley’s spa offering can be seen here.